People have had pets for thousands of years. 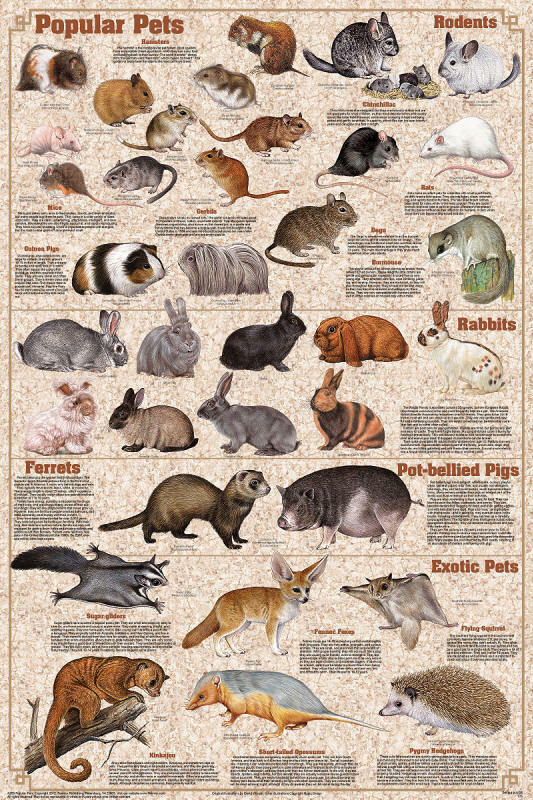 This new Popular Pets poster complements our popular content-intensive posters of dog and cat breeds. It features 35 beautiful and highly accurate illustrations of popular pets, along with descriptions of their origins, behavior and pet-care tips. It includes 18 "pocket pets," such as guinea pigs, mice, rats, gerbils and hamsters, and even the exotic African dormouse and degu. Rabbits can be quite fancy and nine different breeds of are shown. Ferrets and pot-bellied pigs are also featured. This poster also includes six of the most interesting exotic pets. These include the fennec foxes, kinkajous, pygmy hedgehogs, Asian sugar glider and the native American flying squirrel.